Great tips. Thank you. I really need to set up an accounts receivable spreadsheet. It’s on my list of things to do! This is absolutely amazing, you are a gem! Thanks for sharing, I love the simplicity of this yet it is so important. I am going to share with others, thanks again! This is kind of awesome, Stacie! Thanks! This is a great idea!! I have been lax about tracking my income since it is so sparse, but I will set this up so I am in the habit. Thanks for sharing!! teressa, i was thinking the same thing! this comes at a great time to make it a good habit, rather than having to look backward. Thanks so much for posing this!!! I really haven’t recorded anything since it hasn’t been that much but it’s good to start now so when my blog really begins to earn income I’ll be prepared. Thanks again! Thanks so much Stacie! I track mine each month too but for some reason, my brain flaked on the year end totals part..lol. Reading this was a great reminder! Great tips – thanks so much, Stacie! I am finally making a little money this year and definitely need to keep better track! I use a similar form, but it’s not so in depth as I don’t make a whole lot yet. Thanks for the great tips though! What kind of set up do you use for review items? I use Google docs for everything! It’s easiest for me to do spreadsheets. Thank you so much for sharing your spread sheet! I have been meaning to set one up but it’s been so long since I messed around with Excel that I have just been putting it off. I’ve been earning extra cash from blogging a for a little while now. A little while actually being about 3 years! So far it’s all been paid into my Paypal account, but now seems like the time to declare all this to the tax man before I’m in too deep. I’ve been speaking to SJD accountancy in my town, but I wanted to ask another blogger about this (hence finding your post in Google). Is there a certain level of income I need to get to before I need to declare these earnings? Do I need to form a limited company, or can I just be self employed? I’m just self-employed and claim all my income on my personal taxes in Canada. I’m not in a high enough tax bracket to make it worth my while to incorporate since its very expensive to do that here. Very cool! I use google docs for everything, too. Love it. I started at the beginning of the year keeping track of income and expenses. I like the idea of the accounts receivable sheet, too. Great tips! Thanks! That AR sheet is so handy! Saves a lot of headaches and stress. Wish I would have found this 8 months ago! But happy to have it for the start of next year! Aaaarrrrgggghhhhh – smacking myself upside the head – I’ve intended to keep track of all my blogging income, expenses etc. throughout the year, instead of waiting till the last minute. I’ve failed miserably, but will definitely get started NOW with the help of your spreadsheet. Stacie! You are a life saver! I’ve been trying to create my own system and it’s just not been working the last few months. This spread sheet is much easier to follow! thank you! This is great. I am not good at all in keeping track of all my business income/expenses. I use my PayPal, check ledger and receipts. It is not very efficient and the last two years we’ve had to get an extension due to my procrastination. I start the year off with good intentions but it slowly unravels. I just spent 4-6 hours over Labor Day weekend getting everything ready for my husband. Great spreadsheet by the way! I also use a spreadsheet split into 4 tabs. Income US, Expenses US, Income Cdn, Expenses Cdn. there is a column to say what each is for. My accountant then assigned them to their proper spots for income purposes. She said for not being an accountant my spreadsheet was great as it had everything she needed. I am going to add an A/R tab though. I always forget who owes me what. thank you Stacie! I’ve dl’d the doc and will start using this today! I am so glad I found this today, this is the motivation I need to get that A/R going! I have been going with all that in my head forever. Thanks so much! Thank you so much for the spread sheet. This will be so helpful. I made my first $50 this year so that has not been hard to track. But I am sure the spreadsheet will come in handy in the future. This is great thanks for sharing. Do you record product values for merchandise received? I know some do & some don’t what are your thoughts since you have had an accounting background. Thanks in advance. I don’t do that many reviews myself anymore and the ones I do I don’t record. They are never very much in value though. I’m not sure how it works in the USA though. I’m in Canada. This is exactly what I’ve been looking for for a while- and of course procrastinating about. 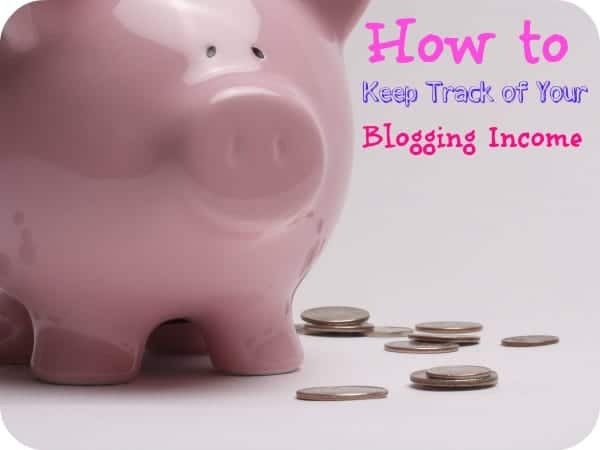 I’m terrible when it comes to tracking money, as I’m sure a lot of bloggers are, as it’s one more thing to do in the myriad of new things we’re doing as bloggers. Thanks so much for sharing with us! I do the same thing you do to keep track of income and expenses except I keep everything on one sheet. I have a column for the date, name of the company and/or rep, product and/or money owed, date paid, how much paid. Money for things I paid to people is in red (meaning negative) at the end of the year, my spreadsheet automatically totals the income vs expense. This is very helpful for me. I’ve not tracked because my blogging income is so small but I should get in the habit of doing it. Thanks for the spreadsheet! Thanks so much for writing this! I’ve downloaded your spreadsheet. This is great! I’d never kept track before. ohmygoodness Thank you for this! And thank you for sharing your template!! Oopsies, I do paid posts and they send me the tax info, but never really put much thought into other things I get paid for like through Paypal. I will look at your spreadsheet and should start keeping track. Excellent article and extremely useful ! Thank you for taking the time to document and share templates. I really need to stay on top of this in 2013! I think when you really start treating your blogs as a business and keeping good records it clears your mind to find new business ventures and creative ideas! Thanks so much for sharing these tips! I will be sure to incorporate them in 2013! Great tips. It is easy to lose sight of the importance of keeping track of earned income. Thanks so much! I tend to overcomplicate any spreadsheet I create. The one you’re sharing is exactly what I need. I have yet to make money from my blog, but I see the potential as I continue more work into my blog. Thank you for sharing your template. I just launched my blog a few months ago so I have all expenses and no income. I am thrilled to find your template so I can track my losses for income tax writeoff purposes. Thank you for sharing – I didn’t know where to begin! Hi, paying you a visit through The SITS Girls. Thank you for the post, it’s very useful to see it all organized that way. That is really great information! I’m fairly new to the blogging world and haven’t made any money as of yet! I do my own taxes since I used to work in accounting. I would print them off though and bring them into the accountant if I was having them do them for me. Stacie you are just the girl I’ve been looking for! I’m running a blog in Alberta and was undergoing the difficult task of finding a bookkeeper/accountant who knew something about the blogging industry and how to record said expenses/income in Canada. This post was very helpful and I’ve downloaded your Blogging Income Spreadsheet. Would you be available as a resource for any questions that I may have in this regard? If so, could you email me your rates? So glad to have found you via SITS Girls! I could try! Note that I’m not an accountant anymore so I may not be able to answer everything. Hi Stacie! Was trying to use your spreadsheet but it tells me that I need to request edit access to use it. All of the options are grayed out except Data. Thanks! It’s set to view only. Did you make a copy of it? So happy I found this article! Just made a copy of your template and really excited to use it and start fresh this year!